645 water cooled DOHC vee twin with electronic sequential fuel injection, twin plug heads. 6 speed gearbox and chain drive. Steel tubular chassis with rigid mounted engine as a load bearing member. Telescopic front forks and progressive linked monoshock rear with adjustable preload. Dual front discs with 2 piston calipers and single rear disc brake. a long weekend away with gladys. . .
Suzuki have something of a tradition for naming their very best bikes after swords. The early eighties were blessed with the Katana, one of the best bikes ever made until that point and named because its silhouette was supposed to be reminiscent of the Japanese sword. No, I couldn't see it either, But the original 1000 and 1100cc Katanas really were fantastic bikes. And now we've got the Gladius. It may be named after the short sword used by the Romans, or it may not. But it certainly does have something in common with the ubiquitous weapon of the legionnaire. It is extremely easy to use with minimal additional training, it has no peculiar quirks whatsoever and it is devastatingly effective. It's also something which can be used adequately or very well indeed with just a little bit of application by the user. Now all of that may make the Gladius sound a little dull. And that's not fair, as we'll see later. As so often happens, I've got ahead of myself. Let's look at the Gladius and have a ride before we come to any conclusions. 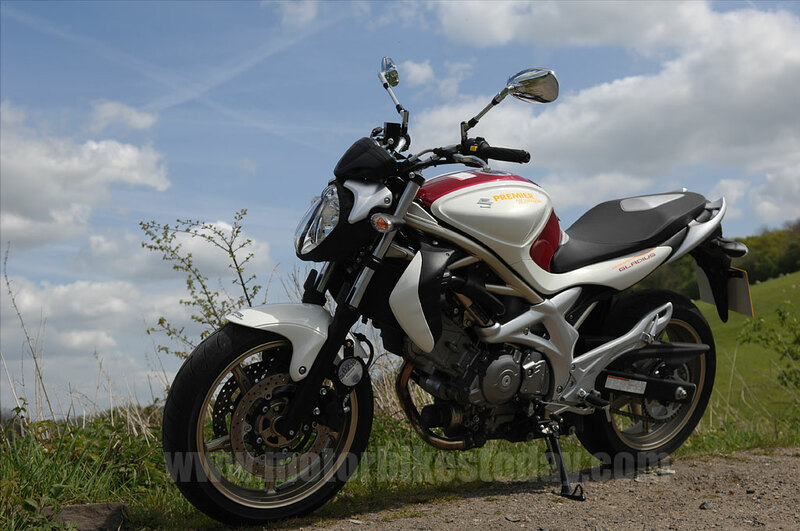 The Gladius, as you may know, is Suzuki's replacement for the phenomenally (and justifiably) successful SV650. It uses a tweaked version of the same engine in a broadly similar frame with pretty much the same overall dimensions. 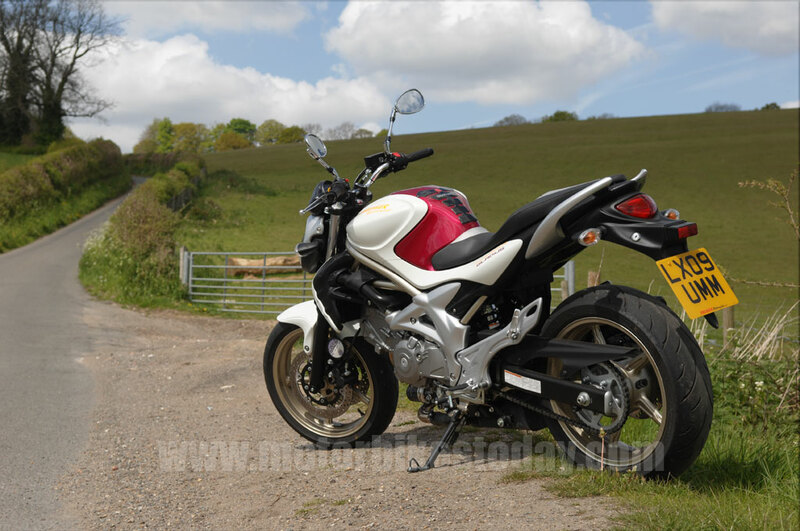 Styling is, of course, subjective but Suzuki appear to have gone for a modernised version of the original curvy SV, and personally I think it looks pretty good. It actually manages to be different from the norm, which is an achievement in itself. The tubular frame is on display as with the original, and though personally I find some of the extra plastic bits a little questionable there's no doubt that it's a nice bit of metalwork. Suzuki have managed to make the radiator look OK with some neat shrouding, always a tricky challenge with naked, water cooled bikes, and the headlight and instrument binnacle is nice and interesting without being over styled. Even the paintwork is well done, with more, um, masculine colour schemes available as well as this one. Because there's no two ways about it, this motorbike is pink. Not all pink, agreed, but pink. And that's why it ended up being called Gladys. Actually it's my daughter's fault - she started it and it stuck. Sitting on the Gladius is a pleasant, unthreatening experience. Everything is exactly where you would expect or need it to be. Including the ground, which remains firmly within reach as the generous and comfortable seat manages the neat trick of being both amply proportioned and narrow enough to make the reach down quite easy. Clocks are clear an unclutteres, giving just the right amount of information while avoiding overload and the mirrors are well spaced, clear and comfortably usable. There's a theme developing here, I think. Comfortable, easy to use, unthreatening. Sounds as though Suzuki have targeted this at the less experienced end of the market. Well hold that thought because we're going for a ride. We'll talk about it later. Start the Gladius and nothing especially exciting happens. The engine is quiet, almost muted in fact, and offers little vibration. Yes, you know it's running, but it's quiet and smooth. 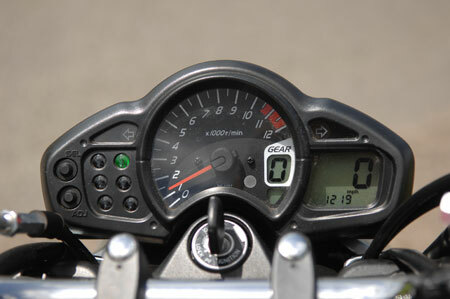 The clutch is light and pleasant to use, and the gearbox is typical Suzuki - slick and accurate. The mirrors, as you might reasonably expect on a naked bike, are clear and well positioned. Low speed handling is delightful. The Gladius is beautifully balanced and has an extremely tight turning circle. It's also quite narrow and carries its weight well. Add that to the light clutch and responsive, torquey power delivery and you're looking at a bike that is brilliant in town. Get on the open road and the story remains surprisingly similar. Normally there is a compromise, an inevitable tradeoff between cost, usability in town and open road ability. And of course there are some areas where the Gladius is weaker than it could be if money were no object.The brakes are the main thing I can think of, which are adequate but no more than that. Suspension is compliant enough and seems to absorb most of the worst that our undermaintained roads can throw at it while maintaining sufficient control to avoid any feelings of wallowing or incipent instability. 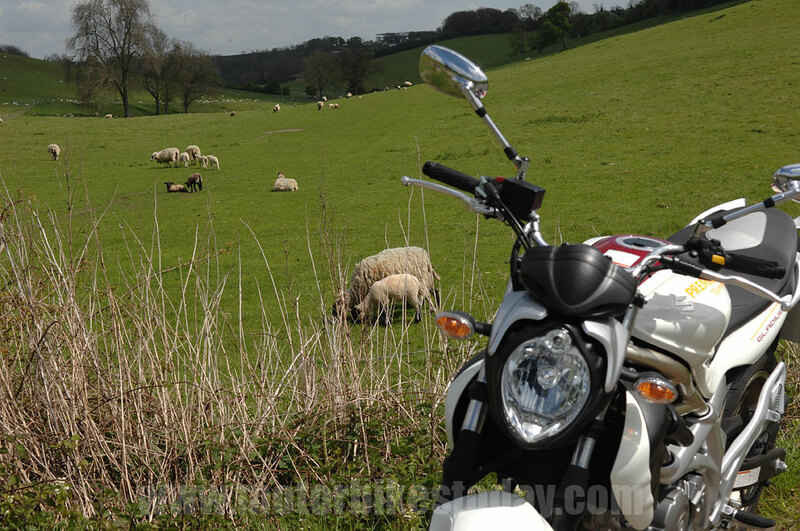 Performance, too, is ample with the revamped vee twin revving eagerly and pulling better than you might expect something of this size to manage. Obviously the riding position and lack of wind protection make really high speeds a bit of a chore, but comfortable cruising at a sensible bit above the motorway limit is perfectly achievable. But motorways are not where Gladys excels. No, the ideal place to take Gladys for a bit of adult fun is either an open B road or a smaller A road. The type where the curves come thick and fast, where planning ahead and smooth riding pay off better than frantic point and squirt behaviour. On a road like this the little Suzuki responds perfectly, changing direction easily while remaining stable through long bends, maintaining speed comfortably but able to lose it (and put it back on again) quickly enough as well. You'll not stay with a well ridden sportsbike but you will be able to stay with most as, in truth, their riders aren't able to get as much out of the bikes as you are. So here's the thing. Suzuki have produced probably the perfect first big bike. It's easy to ride, unthreatening, comfortable and adaptable. It also looks pretty good and it's inexpensive. But what they have also managed to produce a bike that will be equally rewarding for a more experienced rider, having accessible performance that allows you to really make the most of the road ahead of you and at the same time feel as though you're really justifying your position on the bike rather than acting as little more than ballast. Of course it's not all roses. The suspension is surprisingly good but I am a very average size and weight. If, for example, I were a real flywieght then I suspect it might turn out to be a little underdamped. And if I were a bulk pie consumer then it would probably be a little too softly sprung. These things aren't really very adjustable, which is only to be expected on a bike in this price range. It's not going to be a big deal in, I'd say, ninety percent of cases. But you might want to check it doesn't affect you. While we're on things built down to a budget, the brakes aren't quite as fantastic as they might be. They're perfectly adequate but not really more than that. Now for the less experienced rider that's a Good Thing. They are progressive and unlikely to lock up when you take a handful, unless you are really ham fisted. But for the more experienced rider who might be pressing on a little, better, or at least sharper, brakes might be welcome. It's probably something you could fix with a bit of tweaking, but again it's a slight disappointment. The last paragraph, having re-read it, is a bit unfair. Or at least could be construed as such. Because although the points I make are true, they are minor as well. 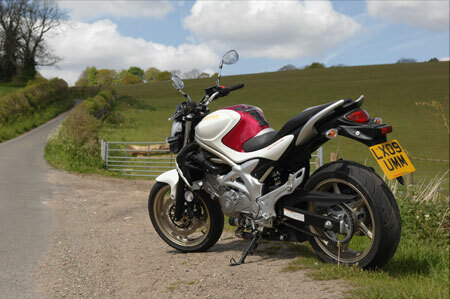 The Gladius is a truly excellent bike. I wouldn't buy a pink one personally, but it's good looking, handles nicely, is comfortable and goes as well as you could reasonably ask. 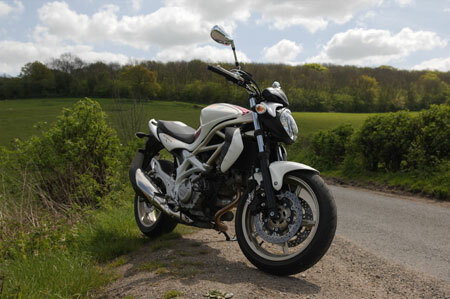 Oh, and it has character as well - it's a genuinely fun bike. I'd recommend it without reservation, especially at this price. As usual, thanks to Premier Suzuki in West Wickham, Kent - 020 8777 8040 - for the loan of their demonstrator for a few days. Nice people, private company, worth doing business with.